This SGS Thompson STA013 MP3 decoder chip does all the hard work of turning a MPEG-1 Level 3 (MP3) data stream into a fully decoded digital audio data, which is compatible with many digital to analog converter chips. We now have a page with easy-to-follow instructions for using the STA013 and CS4334. 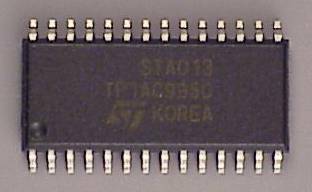 More information about the STA013 chip can be found at ST's website. This MP3 decoder is compatible with the CS4334 24 Bit DAC. This is a 3 volt only chip. It MUST NOT be powered from 5 volts. Please carefully test your power supply voltage before using this chip, since it is expensive and will almost certainly be damaged if used from a common 5 volt power source. Signals from a 5 volt system should be buffered with inexpensive logic chips running at 3 volts. The STA013 requires some initialization using I2C communication. ST provides a configuration file that must be downloaded to the chip. A sequence of other configuration commands must then be written to configure the DAC data format and PLL (crystal freq), and finally the "run" command is sent to tell it to start decoding. Approx 4k of data storage is required by the system to hold the config file and setup parameters that need to be sent. We are planning to add a web page (by the end of Sept 2000) with a working example of this configuration, and a utility to convert their config file to intel-hex, for easy download to your system's memory. This config process is more complex than using resistors to configure the MAS3507D, but after you go through a bit of work to properly configure it, the STA013 produces a great 24 bit audio bitstream output as a much lower cost. Another Site with source code: Jake Janovetz has this web page about his project using the STA013, and he shows C code to initialize and manipulate the STA013. It's not clear if he allows anyone else to use his code, but it is available for viewing. We can not know if his code works, but it looks like it should. Instructions For Using The STA013 and CS4334.